This month marks the 90th anniversary of the death of Seamus Ó Maoildhia, or Seamus O’Mulloy, of Cloonboo. 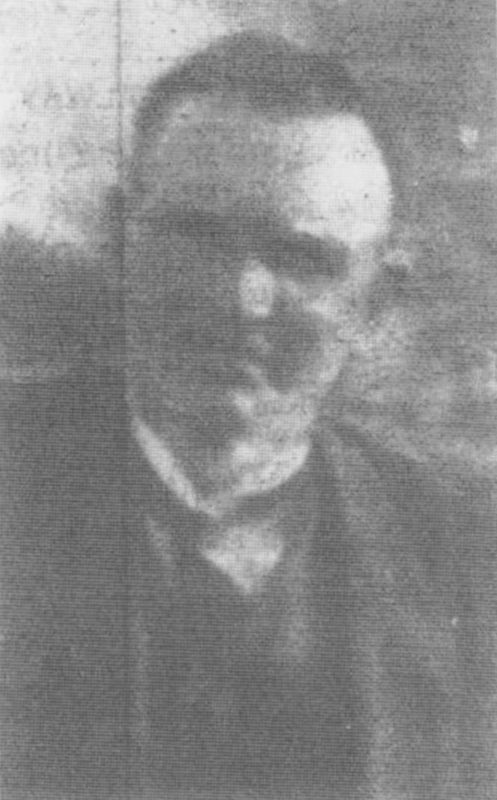 Born in 1881 to Seaghán Ó Maoildhia and Bríghid Ní Áinin, Seamus received only four years of formal education, but exhibited a keen interest in the Irish language from an early age. He was appointed as a teacher by Conradh na Gaeilge aged 19 years, teaching first in Ballaghderreen and later throughout Mayo, Sligo and Leitrim. He was acquainted through his work with Douglas Hyde, later first President of Ireland, and assisted him greatly in collecting songs and stories at the beginning of the Gaelic Revival. He later became an organiser for the United Irish League, losing this position when the Irish Parliamentary Party was decimated in the 1918 General Election. He afterwards oversaw the overthrowing of the ineffectual board of truestees of the Loughs Corrib, Mask and Carra Drainage Board, and was elected to the board following this, regularly calling attention to the neglect of the Corrib drainage in the 1920s. He stood at the general election in June 1927, and his failure to secure a seat, together with the death in 1926 of his brother, brought about a severe depression which exasperated his already poor health. He died on 22 June 1928 at the young age of 46 years. Later, in 1940, his sister Sighle, herself a noted Irish teacher, collected and published his poems and songs as ‘Dánta agus Amhráin’. 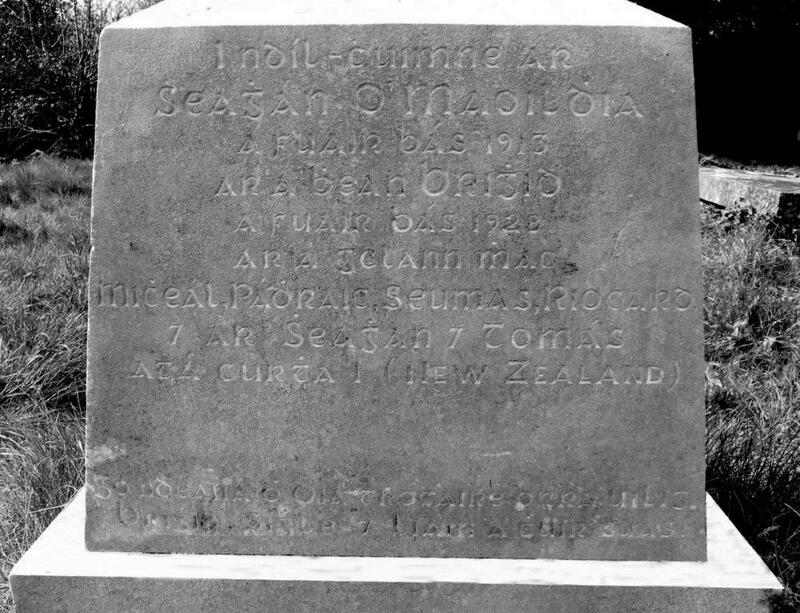 O’Maoildhia family tombstone in Annaghdown Cemetery, which reads: I ndíl-chuimhne ar | Seaghán Ó Maoildhia | a fuair bas 1913 | ar a bhean Brighid | a fuair bás 1928 | ar a gclann mhac | Micheál, Padraic, Seumas, Riocard, | agus ar Seaghan agus Tomás | atá curtha i (New Zealand) || Go ndeanaidh Dia trocaire orra uilig | Brighid, Sighle agus Liam a chuir suas. One of his songs, Amhrán Feise Mhuigheo, has been adapted by Scoil Acla as Teanga Bhinn ár Máthar, and has been translated into Scottish Gaelic and recorded by the well-known traditional singer, Kathleen MacInnes. The air for Teanga Bhinn ár Máthar was composed by John ‘Twin’ McNamara of Achill, mainly to the words of Ó Maoildhia’s Amhrán Feise Mhuigheo, with a few changes. It features in this video from the 2016 Achill Harp Festival which credits Ó Maoildhia in the video info. It was in Cloonboo, in Annaghdown Parish, Co. Galway, that Séamus Ó Maoildhia was born in September 1881. His father was a poor farmer and had eight other children to rear on the produce of his small piece of land. He was therefore not able to do anything for Séamus; that is, to send him to College or otherwise. He spent only four years at school, but he had an extraordinary mind. He had a huge respect for Irish and worked hard for its promotion from once he was able to read and write. He went to Ballaghaderreen teaching for Conradh na Gaeilge before he was 20 years old. He spend about four years teaching in Mayo, Sligo, and Leitrim. He was known at every feis and aeraíocht in Connaught, as well as the Oireachtas. It’s many the prize he won for his essays, poems, and orations. It was during this time that he composed most of the poems in this book (Dánta agus Amhráin). He won a gold medal for one of them at the Connaught Feis. He was unequalled in the skill of oration. His Irish grammar was impeccable and he had fluent Irish conversation at his fingertips. An Craoibhín [Douglas Hyde] said he was one of the most fluent speakers in Ireland. He collected many stories and songs from the oral tradition of the old people, and he sent them to An Craoibhín when he began the Gaelic Revival. He was selected as an inspector for the Land Commission over thirty years ago and he worked hard on behalf of farmers for twenty years. There wasn’t a parish around the West of Ireland or County Clare that he wasn’t known in. He lost this position after the General Election of 1918 and didn’t succeed in gaining any paid employment after that. When summer courses were started for teachers, he was appointed as a teacher and he did good work there for the Irish language. Readers of the newspapers should remember the pieces written by “An Connachtach Béal-Bhinn” [the Sweet-Tongued Connaughtman] or “Sean-Ghaeilgeoir” [old Irish speaker]. In particular, he wrote for the Connacht Tribune for twenty years. Alas! Séamus is gone now for ten years. He died in Cloonboo on 22 June 1928. God grant him the light of Heaven. I am grateful to Fr S.S. MacSíocháin, S.J., Galway, who helped me in putting this book together, and to Conradh na Gaeilge, who gave permission for reprinting the two songs (12, 13), which were first published in An Claidheamh Soluis. Síghle Ní Mhaoildhia (sister), 1940.